While everyone else was moving backward, he charged forward. From the beginning of the day, he was staring down the barrel of a 5-shot deficit, but by the end of the day he found himself standing alone at the top of a hill. Only instead of a hill he was standing on a mountain (because a 3-shot victory in a tightly contested golf tournament is like winning a baseball game 9-1). Phil Mickelson played the round of his life on the grandest of stages on Sunday. It is a round that will go down in history as one of the finest of all-time, and there were some signature shots that will be remembered for decades to come. 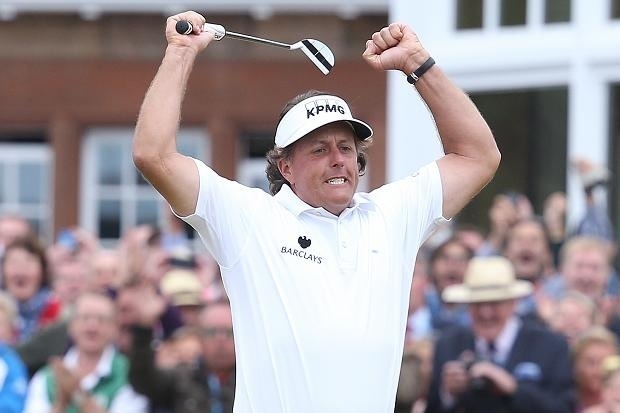 This phenomenal display of golf earned Mickelson his 5th career Major and his 1st Open Championship. With this victory he finds himself on a short list of men to have won 3 different Majors. Mickelson, now 43, didn’t win his 1st Major until the age of 33. Over the past decade he and his game have matured nicely. In the past Mickelson was pegged as the best to never win, as he came up short time after time. It was always the high risk/high reward shots that seemed to draw him in like a magnet. Unfortunately for Phil, these shots always seemed to become his downfall in the most clutch moments. We all remember the horribly sliced tee shot on the 18th hole of the 2006 U.S Open (you know the one off of the tent). That shot was then followed by the inane decision to go for the green and subsequently was drilled right into a tree. It has been his transformation from then to now that has been the difference. He still has the best game in the world from 100 yards and in, and this past weekend his best friend was his putter. He controlled his emotions and made a late surge on the back nine on Sunday. This had to be the best stretch of golf he has ever played. To birdie 4 of the last 6 holes while seemingly everyone else on the course was faltering and misstepping and landing up against the walls of cross bunkers, was simply something to behold. The shot that will stick in my mind has to be Phil’s 2nd shot from the fairway on #17. The commentators had just finished saying that they doubted that Phil could get it home from 300 yards away, however Phil hit a perfect 3 wood and along with a fortuitous bounce and roll he found himself with a 40 foot eagle try. He proceeded to make a nice lag putt for a tap in birdie. With nerves of steel he stepped up to the tee at 18 and smacked the ball right down the middle of the fairway. From there he put the ball to about 10 feet on the 18th green. To ensure that this Major would not slip through his fingers, he put the final nail in the coffin and drilled the putt for a birdie. With a double fist pump above his head, he knew he had done it. He had just shot a 5 under 66, and was just a short wait away from winning at a venue that he never thought he could win. Even though all the doubters had started to write Lefty off, he is actually playing some of the best golf of his career (even with the heart wrenching runner-up finish at the U.S. Open this year). All in all the round of golf that we all were privy to yesterday was a special one. It should go down as one of the best rounds of golf we will ever see. Phil has constantly been overshadowed by El Tigre his entire career, but people should appreciate the talent that is The Hefty Lefty. He is approaching top ten golfer of all-time status. Maybe Tiger and Phil can renew their old rivalry since clearly little Rory Mcilroy will be too busy visiting his shrink on Sundays. What do you think? Will Phil win the PGA Championship or will Tiger snap out of his major funk and add to his trophy case? Or is there someone else from the field you think will emerge? Nice reporting Davey! Philly Creamcheese as I affectionately like to call P.M. is without a doubt one of the greatest sports figures of this era. He shows class, grace, and humility even when having a moment such as the one you referenced about the tent. For those of you who may not know, he and his wife have a wonderful charitable foundation that supports education especially the field of science. Thanks again for this heartwarming entry. I try my best at all times and will keep them coming. Thanks for reading as always.